One of Italy's grandest and most history-saturated town halls, Vence's Palazzo Ducal (Doge's Palace or Ducal Palace) is a massive Gothic-Renaissance confection raised in 1309, and rebuilt after a 1577 fire. 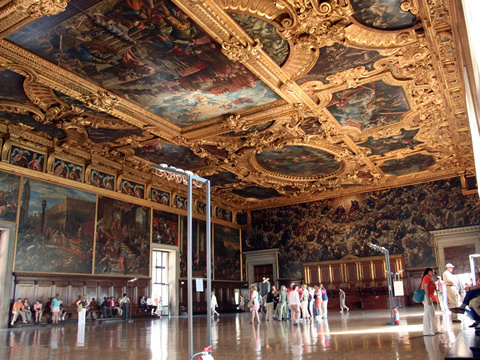 The public halls of the Doge's Palace are heavily decorated with canvases and frescoes by Venice's greatest artists—works by Veronese and Tintoretto are exceedingly abundant. The signposted route walks you through, and will take about 45 minutes to an hour and a half depending on how interested you get. At 53m by 25m (174 ft x 82 ft), this remains one of the largest rooms in Europe, decorated after a 1577 fire by Paolo Veronese, both Tintorettos (Jacopo and sone Domenico), and Palma il Giovane. This was where the Great Council of Venice once met, comprised of anywhere from 1,200 to 2,000 leading citizens (bascially all the males over the age of 25 from patrician families). 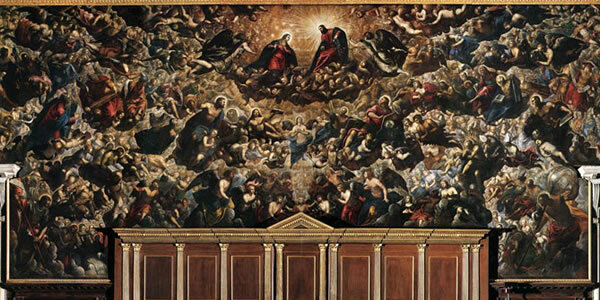 Along the wall above the Doge's Throne is Paradiso (1588–92), the world's longest canvas painting, executed by Jacopo Tintoretto and his workshop. Jacopo Tintoretto also got the commission (largely executed by his son) to paint the portraits of all the past doges, in order, ringing the tops of the walls. (Only 76 fit here; the overflow is in the Sala dello Scrutinio). Note the black cloth painted in the place of one portrait. This is where the infamous Doge Marin Falerio's face wold have been—had he not committed the ultimate treason and attempted a coup d'état in 1355. He recieved not only a death sentence, but was also condemned to damnatoio memoriae, the total eradication of his name and memory from all official records. 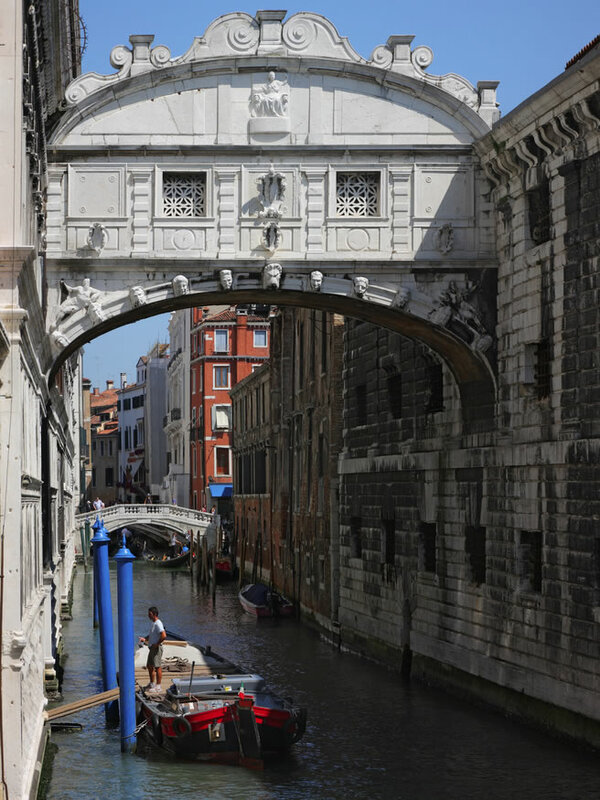 Off the back of the building, you cross over the famous, enclosed Bridge of Sighs (Ponte dei Sospiri), named by romantic-era writers who imagined condemned prisoners letting out a lament as they crossed and got their final glimpse of Venice and her lagoon through the tiny windows in the center. The cells on the other side preserve the scrawls and graffiti of ancient prisoners. But even with an informative audioguide and the English placards describing the artworks and the civic purpose of each room, I find that simply wandering the public halls and nothing else leaves me a bit cold. The real governing of the Venetian Republic was not done here in plain sight. True power was wielded in a network of low-ceilinged, wooden-plank corridors and tiny offices wrapped around this public palace like a clandestine cocoon, the entrances hidden behind secret doors set into all those fancy oil paintings and carved woodwork of the public rooms. Here private secretaries kept records and compiled accusations made against people both lowly and high-placed (see the box to the right). 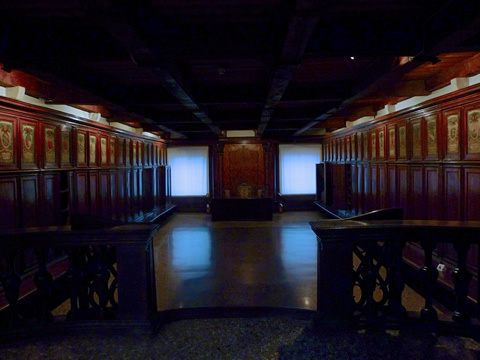 The only way to see this inner sanctum—and for the best primer on Venetian politics and historical intrigues—is to take the excellent 75-minute "Itinerari Segreti," or Secret Itineraries tour. Yes, it is intensely expensive (€20 at last check), but this just might be the best sight tour in all of Italy—not necessarily because of the guide (some are better than others), but because of the secret world you get to see. 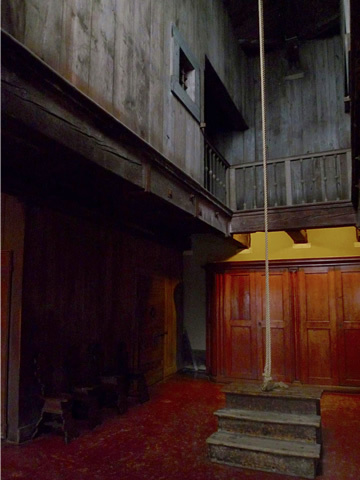 This tour will show you the large chamber where the dreaded Council of Ten met to decide the fate of the Republic—and the people who crossed them; the two-story inquisition room, complete with hangman's rope ready to administer swift justice once the accused was found guilty; and the "leads," the low prison cells up in the roof rafters (named for the lead tiles of the roof above) where your guide will recount the tale of Casanova's famous escape. Best part of the tour: Your group keeps popping out of secret doorways into the public rooms only to vanish behind yet another hidden panel, surprising all the tourists milling about who didn't book this tour (and making them insanely jealous). 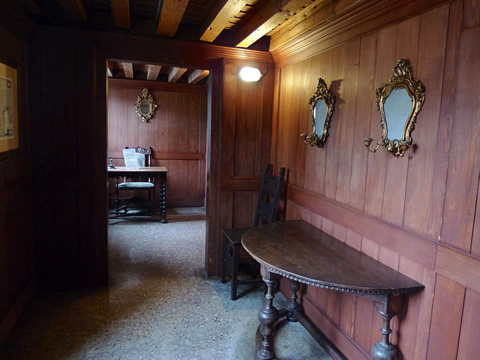 After the tour, you are free to explore the rest of the palace's public rooms on your own. 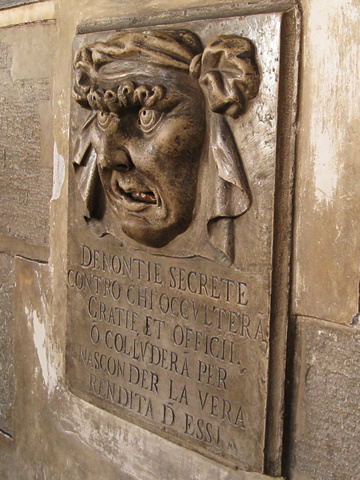 Any Venetian citizen could accuse someone of misdeeds by writing the denunciation down and slipping it through specially placed Bocca di Leone ("Lion's Mouth") slots in the Palazzo Ducale's walls. Those who were investigated and found guilty were often subject to the favorite Venetian punishment: exile. While this activity sounds like a prime breeding ground for backstabbing and malicious gossip, it was a highly regulated procedure. All accusations had to be signed and witnessed. What's more, if they proved merely to be slanderous and not actionable, the would-be denouncer would be in serious legal trouble of his own. [If the timing doesn't just work out for you and you're really gung-ho to do this tour, for an extra €31 per group (on the top of the €20 cost of the tour itself) you can schedule a private "Secret Itineraries" tour at any time after 1pm (though these private tours are suspended in July and August]. How long does Doge's Palace take? Planning your day: Touring the public areas takes about 30–45 minutes—maybe an hour to 75 minutes if you stop to read all the inforamtive plaques. The Secret Itineraries tour takes roughly 75 minutes (after which you'll likely want to wander the public spaces for another 30 minutes or so). The ticket office closes 1 hour before the museum. The standard admission ticket to the Doge's Palace actually covers four museums on the square—hence its name: I Musei di Piazza San Marco—so you might as well use it to pop into at least the Museo Civico Correr. However, if you're pressed for time, go ahead and skip the less interesting Museo Archeologico Nazionale (Archaeological Museum) and Sale Monumentali della Biblioteca Nazionale Marciana (frescoed, monumental rooms of the Marciana Library). If, in addition to those museums on Piazza San Marco coverd by the standard admission, you intend also to visit the Ca' Rezzonico and at least two of the other sights covered by the Venice Museum Pass—perhaps the Ca’ Pesaro or the Glass Museum on Murano—go ahead and buy the Venice Museum Pass. This will save you money. 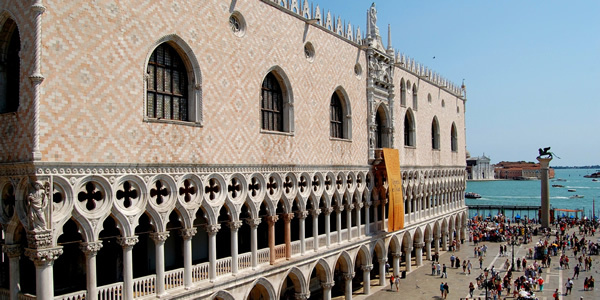 Visit the Doge's Palace after 1pm—and buy your ticket ahead of time at Venice Connected—and you can get an Afternoon Ticket at a slight discount. Just what is a Doge, anyway?